There are two types of Mako sharks in existence: the short-finned Mako shark, (Isurus oxyrinchus), and the long-finned Mako shark, (Isurus paucus).These sharks have a wide range and are catch and release for the angler. The long-finned Mako shark is on average slimmer and has very wide pectoral fins, which is probably a sign of this species being a slower swimmer than the short-finned Mako shark. 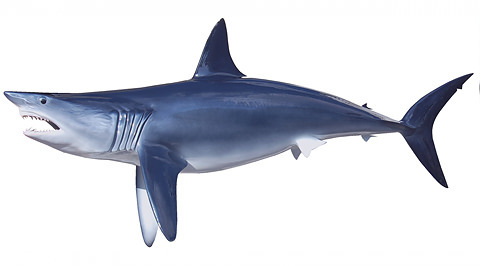 The long-fin Mako is also illegal to harvest, however practicing catch and release will still provide you the opportunity to get your impressive trophy mount. The short-finned Mako’s snout is very conical and the eyes are comparatively large. The pectoral fins are broad and have narrow tips, and the anterior margins are smaller than the length of the shark’s head. The first dorsal fin is large, while the second fin and the dorsal fin are much smaller. The caudal fin is shaped like a crescent. You can notice strong keels on the caudal peduncle, but there are never any secondary keels found on the caudal base. The female Short-finned Mako shark gives birth to live pups that are 60-70 cm long when newly born. One litter can contain from 4 to 16 pups. Although both sexes grow at about the same rate, females are thought to have a longer life span, and generally grow larger and more robust. The long-finned shark is a long slender species with a moderately long conical snout that is widely pointed. Long-finned Mako sharks have been spotted in the Western Atlantic, the Eastern Atlantic, the Western Indian Ocean, the Western Pacific, the Central Pacific and the Eastern Pacific. There have also been reports of Long-finned Mako sharks living in the Mediterranean, but these sightings are still unconfirmed. The largest known Long-finned Mako shark was 4 meters 17 cm long. The life of the long-finned Mako shark remains largely unknown, but it is believed to spend a lot of time slowly cruising in the epipelagic zone. The hydrodynamic shape combined with great agility has given stories of a hooked Mako jumping into the boat. A known man-eater, the Mako Shark has a cobalt blue back and cold black fearless eyes that will send a chill through the most experienced fisherman.